Preheat oven to 350°. Melt 2 Tbsp. butter in a large skillet over medium-high heat; add apples; sauté 5 minutes or until softened. Remove from heat; cool completely (about 30 minutes). Meanwhile, prepare Streusel Topping and Caramel Sauce. Reserve 1/2 cup Caramel Sauce for another use. Combine flour, baking powder, and salt; add to butter mixture alternately with milk, beginning and ending with flour mixture. Beat at low speed until blended after each addition. Stir in vanilla. Pour batter into a greased and floured shiny 9-inch springform pan; top with apples. 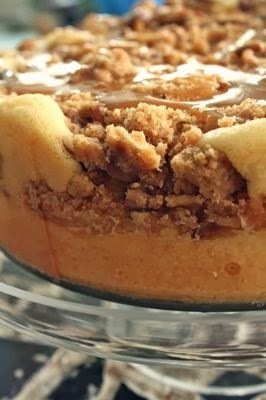 Drizzle with 1/2 cup Caramel Sauce; sprinkle with Streusel Topping. Bake at 350° for 45 minutes. Cover loosely with aluminum foil to prevent excessive browning; bake 25 to 30 minutes or until center is set. (A wooden pick will not come out clean.) Cool in pan on a wire rack 30 minutes; remove sides of pan. Cool completely on wire rack (about 1 1/2 hours). Drizzle with 1/2 cup Caramel Sauce.